Saturday certainly turned out to be ‘one of those days’ for luckless Nene Valley Harriers. Their British League Division Three match at Bournemouth was always going to be difficult with a team badly hit by injuries, especially as solid points scorers Sean Reidy and Kane Wright were among the absentees. What they didn’t need was more misfortune on the day. Yet, that’s just what happened. They lost both high jumpers to a car crash, they suffered a couple of disqualifications on the track (110m hurdles A race and 4x100m relay) and were robbed of potential points when the pole vault was cancelled due to high winds. The catalogue of misfortune all added up to a disappointing seventh-place finish and leaves Nene Valley in a battle against relegation with one match remaining. “It certainly was a very frustrating day,” reflected team boss Tim Needham. “But on the plus side we fielded a very young team with seven under 20 athletes (Phil Wilson, Ollie Bowling, Ashley Sandall, James McCrae, Isaac Huskisson, Callum Crosby and Matt Hudson) in the team and they all performed well. 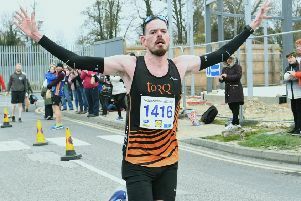 “And it was good to see some of the old timers turning out to hold the fort - people like Ken Baker, who was back in action after two years of serious illness, and Adam Birch running the 5k after a long absence as well. “This was always going to be a difficult season with the travelling to distant venues and to compound this the last meeting on August 6 is at Yeovil! The performance of the day for Harriers on Saturday came from David Bush, who won the 400m hurdles A race in Reidy’s absence in a season’s best 56.46. Harriers’ only other win came in the B string hammer from Phil Wilson with 43.42m. Match result: 1 Bournemouth 313pts; 2 Newquay 306pts; 3 Trafford 297pts; 4 Havering 292pts; 5 Chelmsford 282pts; 6 Southend 244pts; 7 Nene Valley Harriers 238pts; 8 Yeovil 223pts. 100m - A 5 Darrellon Holding 11.09, B 7 Max Everest 11.39; 200m - A 6 Ashley Sandall 22.42 (PB), B 8 Callum Crosby 23.87; 400m - A 4 Darrellon Holding 50.42, B 2 David Brown 50.99; 800m - A 3 James McCrae 1.58.61, B 4 Ollie Bowling 2.00.32; 1500m - A 3 James McCrae 4.09.13, B 6 Ollie Bowling 4.18.22; 5000m - A 7 Adam Birch 16.38.93, B 4 Michael Channing 16.45.62; 110m hurdles - B 7 David Bush 17.27; 400m hurdles - A 1 David Bush 56.46, B 3 Philip Wilson 61.71; 3000m steeplechase - A 8 James Vernau 11.08.43 (PB), B 7 Adam Fidgett 13.34.52; 4x400m - 2 Nene Valley 3.25.49. High Jump - A 8 Philip Wilson 1.65 (PB); Long Jump - A 4 Sam Richards 6.80, B 2 Matthew Hudson 6.32; Triple Jump - A 8 Sam Richards 11.33, B 7 Matthew Hudson 10.56; Shot - A 4 Simon Achurch 12.73, B 2 Ken Baker 12.37; Discus - A 7 Simon Achurch 30.27, B 6 David Bush 30.10; Hammer - A 5 Isaac Huskisson 44.71, B 1 Sam Wilson 43.42; Javelin - A 4 Simon Achurch 43.76, B 3 David Bush 41.40.